Southern Maritime Services (SMS) has been selected to provide port handling services for an offshore wind farm accommodation ship calling monthly at Portsmouth International Port (PIP). The 122 m. Wind Solution, is calling regularly at PIP as part of an operation to bring fresh crew and supplies to the massive Rampion wind farm project currently being constructed off the Sussex Coast. When completed, the Rampion wind farm will consist of 116 giant turbines, providing 400 megawatts of electricity to the national grid from a site 13km out in the English Channel. It should be completed by 2018, and it is estimated it will be able to supply 300,000 homes with green energy. Project managers decided on using a floating hotel to keep the construction crew as close as possible to where they are working, cutting hours of transportation every day. They decided that PIP was the perfect place for resupplying the operation, with Wind Solution carrying the necessary personnel and produce to the construction site after a 24 hours turnaround period at Portsmouth. SMS was selected to provide full stevedoring services to the vessel. Its first call this Spring saw SMS, with a small team of six skilled stevedores, load 20 Containers, waste skips and garbage compactors. Subsequent monthly service calls will involve loading of supplies and removal of waste. Its final de-mobilization call will be around March/April 2018. Wind Solution is owned and operated by C-Bed Floating Hotels. 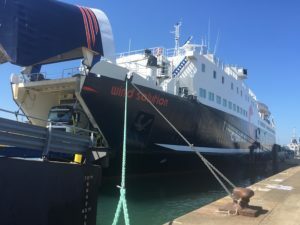 The ship has a purpose built boat landing stage, which will be used by up to twenty smaller vessels to bring construction workers to their accommodation after a day working on constructing the turbines. The ship can accommodate 115 guests, mostly in single cabins.